After we came home from vacation on the weekend I was VERY pleasantly surprised to see a very nice lilac bush! It was in our yard and I was so excited I even did a happy dance! Even though it was pouring rain, I went out with my umbrella and cut a few flowers off the bush and put them in a milk glass vase. 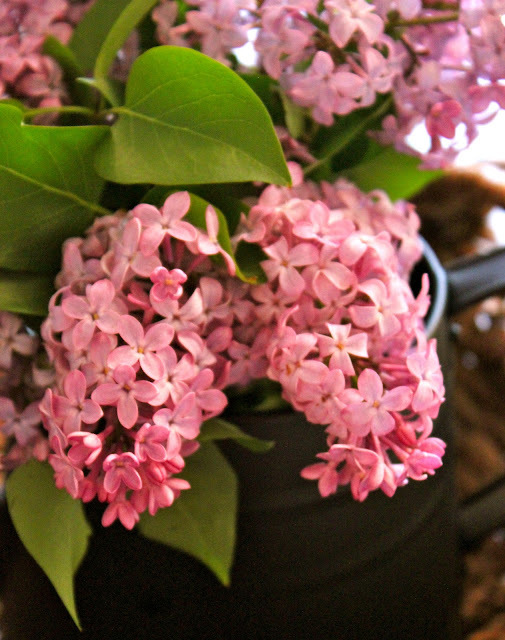 They made the house smell so amazing and spring-like! Today when i got home I realized the flowers I had cut were done so I went out and cut some more. Those tiny, little, purpley pink flowers have me hooked and I just can't get enough. Today I cut enough for 3 vases worth and my house smells like spring. I put the flowers in a little Ball jar I had and then put the jar in this watering can. The watering can was from Target in their dollar area and I paid $2.50 for it. It was galvanized metal, but I put a coat of matte black spray paint on it and I think it's so cute! How can you not smile when you see these little flowers? 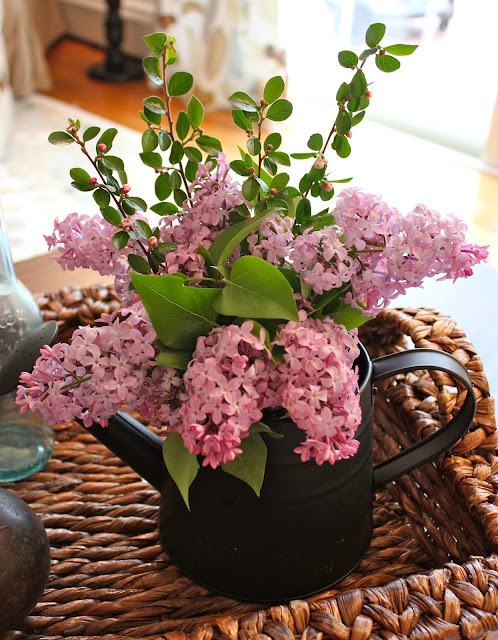 I have no idea how long lilacs bloom or are in season and I don't even want to think about it. I'm enjoying these little bits of spring in the house. Although my Son told me he couldn't believe I would hurt nature like that. I told him I don't stand outside all day staring at the flowers so I needed to bring some inside. He said, "Maybe you should put some in your car then." Hmmmmm now there's an idea! They are gorgeous, and smell soooo wonderful too. Glad you finally got to put a bush in your yard. Im now following you, so please come visit me at PICKINandPAINTIN.blogspot.com and hopefully you'll decide to follow back. THANKS.